REGISTRATION for the 2019-20 SCHOOL YEAR opens in May. Classes start in August. Be sure to grab your spot before they run out! THE 2019-20 WEEKLY CLASS COMING SOON! Make sure you leave room for history this year. 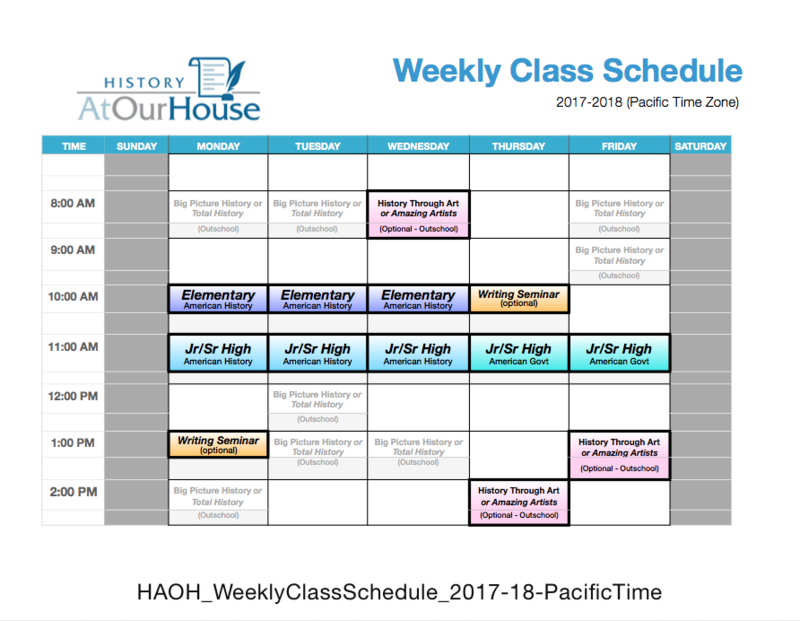 The 2019-20 school year with History At Our House is entitled “Europe, Russia, and the World We Live In” with a wide range of World History topics covered in the core curriculum–including Ancient Greece & Rome–and additional classes. The academic school year begins in mid-August. Download the Academic Calendar to get ready! The 2018-19 schedule shows you what to expect. 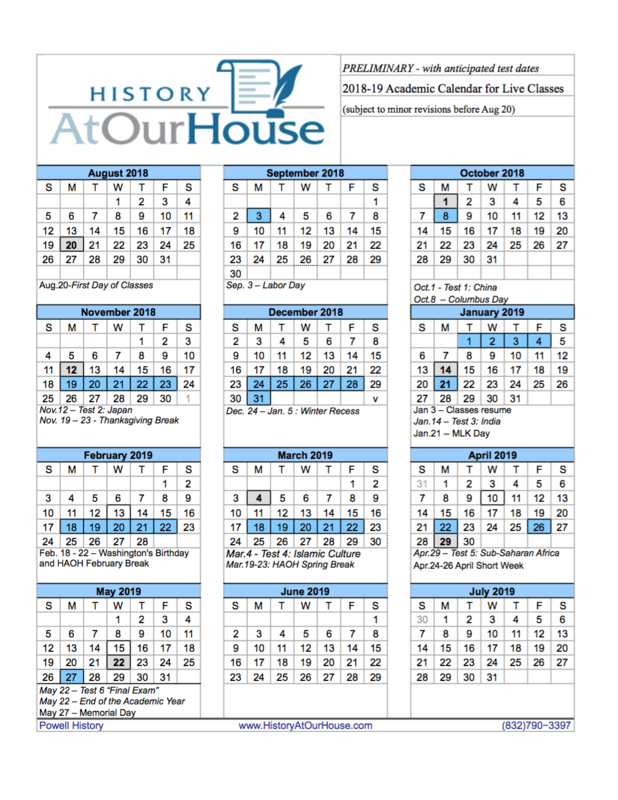 The school year features a core curriculum of world history as well as special topics, writing, art, and also other great classes through Outschool.com. HHM1: Amazing Resources for 2017! HHM2: Why is History Normally So Boring? THE TOTAL HISTORY SOLUTION: ANY TOPIC, ANY TIME. Mr. Powell is (one of) “those teachers”…who make learning meaningful and memorable. Even my daughter, who manages challenges with sustaining attention, easily connects with the subject matter because of Mr. Powell’s methods and enthusiasm. The role of Asia in shaping the world we live in continues to grow. Sadly, the contact between the West and the Islamic world has a tragic character. The story of India, on the other hand, promises a unique integration of Western and Eastern values. What of China? A renewed world superpower? And Japan? Once a terrible threat, now a contributor to a globalized order led by the United States. The story of Asia reveals how the modern international system arose. Recordings in MP4 and MP3 format available for 2015-16. To understand the world we live in, including America, the student of history must study Europe. Europe is America’s “mother continent.” It is also the culture that dominated the world for four hundred years, and spread its form of government to the far corners of the globe. The story of Europe, from the fall of Rome to the present day supranational union is a crucial building-block for students looking to grasp how our world came to be, and where it is going. MP3 and MP4 recordings for 2015-16. This honors program for high school students is recommended for students with a strong groundwork of knowledge in American history, including at least a full year of American history with HAOH at the Jr. or Sr. High level. The course covers the history of constitutional government, American foreign policy, and economic regulation, which three themes are integrated to plot the trajectory of American government into the future as America evolves from a constitutional republic into a social democracy.